Dynamic visualization, analysis and organization of your data! 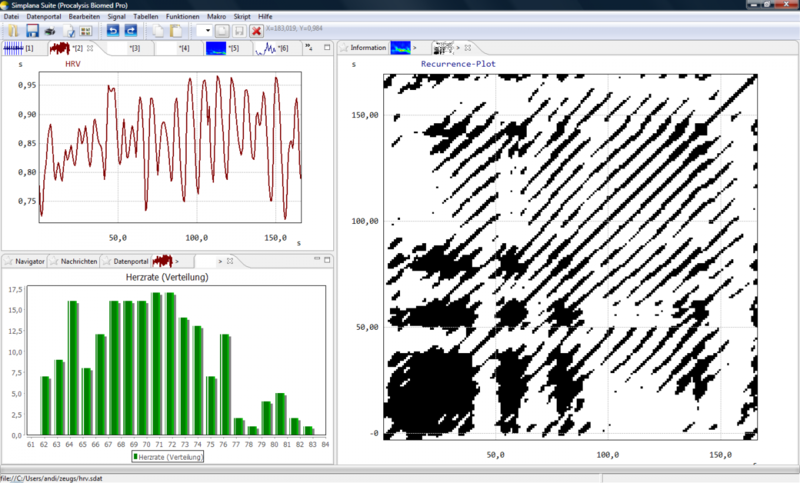 Procalysis Free, Signal und Biomed are software tools used for analysis of bio-psycho-social data. In principle, the modular architecture of our software allows applications to many other areas, e.g. economy and technology. Procalysis facilitates visualization, the organization and understanding of your data. Whether routine application of linear algebra, sequences of mathematical routines, or the development of complex nonlinear processes: Procalysis offers a variety of analytic options for practice and research. The modular architecture allows easy adaptation to your needs. Your comprehensive view of the autonomic nervous system at the heart! Procalysis HRV-Lab is hard- and software for recording and wireless transmission of heart rate data for the analysis of all relevant parameter of heart rate variability (e.g. RMSSD, SDNN, dynamic LF/HF, pNN50, etc.). 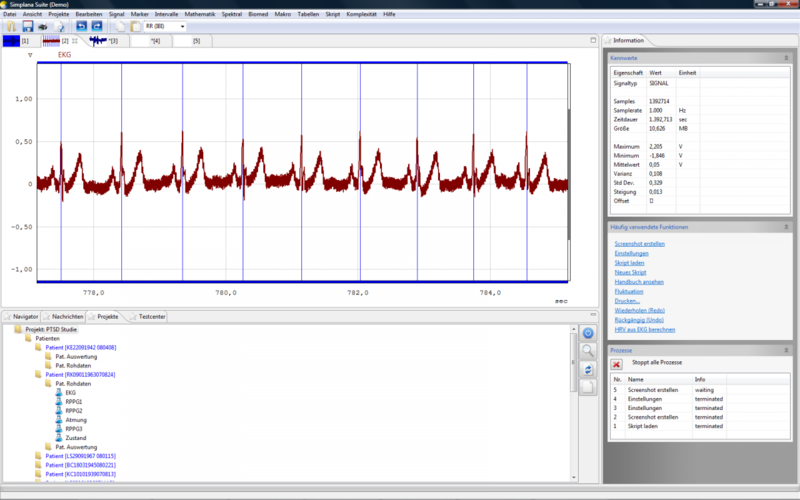 In addition, Procalysis HRV-Lab allows analysis of dynamic adaptive parameter: wavelet based time-frequency distribution, recurrence plots, permutation entropy and additional non-linear parameters. All linear and non-linear parameters are quantifiable! This facilitates greatly statistical analysis. 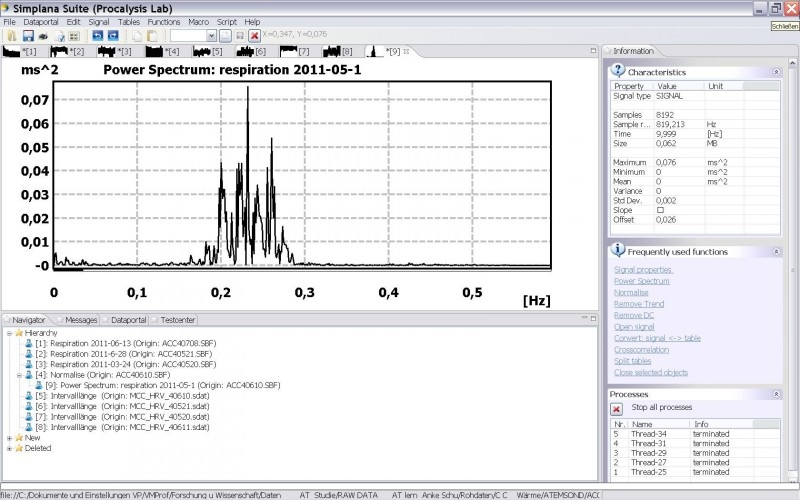 Data acquisition and data analysis operates on any PC or Laptop. Professionally taken, the medical history provides in as many as 75% the proper diagnosis (B. Lown, Harvard Medical School). Our approach supplies the perfect mix: asking standardized – responding individually, diagnosing more accurately! Anamnesis means recollection – which consumes time, costs money – and increases or extends suffering of patients if medicine is sacrificed for money due to austerity. Procalysis eTest Anamnesis seizes the whole thing. The whole thing – somatic, psychic and social problems. You will treat to the point: fast and efficient avoiding stress. Somatic experts find help with psycho-social disorders, and mental health experts find help with somatic problems! Procalysis® eTest Anamnesis – Your preparation of your doctor-patient encounter! Our interactive analysis tool generates a meaningful profile of your or your clients’ strengths and deficiencies. Following personal interviews and intense exchanges with our professional instructors (usually M.D.s, teachers in economy, vocational and industry psychologists), we furnish profiles as an expert document. Our individualized counseling design combines scientific testing, interviews and digitized analysis of your individual potentials, abilities, talents and competences. These results not only assist you with your professional but also with your general planning of your life. Following our counseling, tests, and analyses, more than 600 clients have already evolved into a more successful, transparent, individual and most importantly happier school, college, vocational and professional career! Aachen, Koblenz, also individually differing testing; personal appointments following personal arrangements. Procalysis® eTest Anamnese 1450,- p.a. Kostenangebote werden für Entwicklungsarbeiten nach Projektabstimmung individuell erstellt.